Mark Teague will sign his latest book in the dinosaur series, How do Dinosaurs Say I'm Mad and his delightful humorous book The Three Pigs and the Somewhat Bad Wolf. Whether you know Mark Teague from his fabulous illustrations in the popular How Do Dinosaurs...? series, his hilarious Dear Mrs. Larue books, the very funny Funny Farm, or any of his many other books, chances are you love and adore this one of a kind author and illustrator. We sure do. That's why we're so excited that he's coming to Wild Rumpus on Thursday, May 16 at 6:30PM to celebrate his new book, The three little pigs and the somewhat bad wolf. You should come, too, because this event won't be even a little bit bad. It will be all good. Celebrated children's author Mark Teague returns with The three little pigs and the somewhat bad wolf, a zany retelling of the beloved children's tale. Three pigs spend their money on different things: potato chips, sody-pop, and building supplies. When the hungry wolf gets to the third pig's brick house, everyone comes together and the fun begins. Bring the whole family for this reading and book signing! Mark Teague reads from Firehouse!. 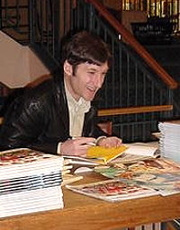 Mark Teague is currently considered a "single author." If one or more works are by a distinct, homonymous authors, go ahead and split the author. Mark Teague is composed of 2 names. You can examine and separate out names.